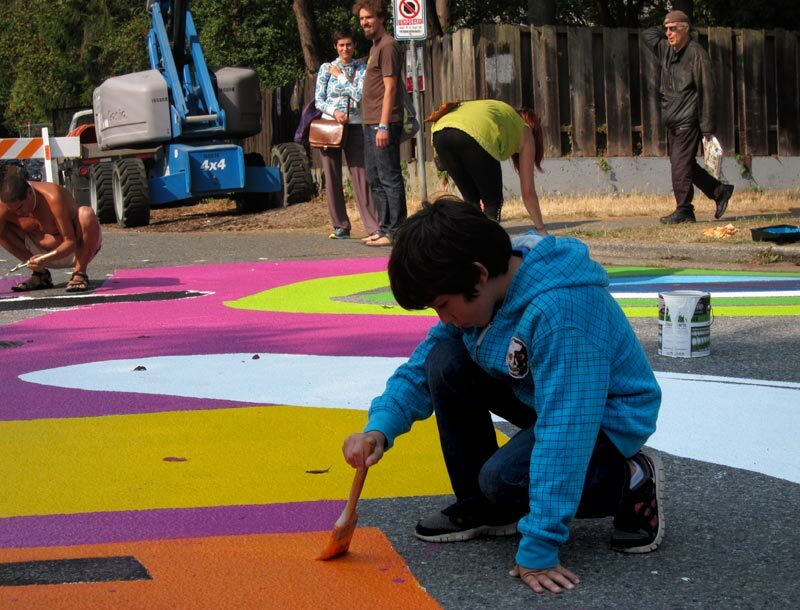 The West End on-street mural was installed on Cardero Street, between Nelson and Comox, on September 22 and 23 with help from many wonderful volunteers and with the support from Viva Vancouver and City of Vancouver’s West End Community Planning team. The mural party was a huge success! We had an amazing turnout, over 40 volunteers had signed up for the painting and our comments book is filled with lovely words of support for this project. There was also a lot of interest expressed in creating more murals in our neighbourhood. Please click here to view all the photos of our community coming together to transform the West End neighbourhood. Thank you to everyone who contributed to this project and participated in its creation! This project was inspired by the City Repair initiative born in 1996 in Portland, Oregon. Sonja Mulabdic, a local artist and a passionate promoter of sustainable communities, initiated the project in partnership with Viva Vancouver. The on-street mural will be the first of its kind in the West End and one of the first three ever to be created in Vancouver. The intent is to bring the community together and transform the common gray intersection on Cardero Street into a place of joy and celebration. Revitalizing neighborhoods through art projects that are rooted in community participation builds strong societal bonds and creates healthy and fun places to live and play. Intersection repair projects are also known to slow down traffic, improve aesthetics of urban environments, and inspire other community building initiatives. JOIN US FOR A SUMMER OF FUN AND CREATIVITY! What a lovely intro to the project. And a great choice of pic to go along. Yay, Sonja. Way to go! Thank you so much everyone for organizing this! It was such a great way to spend a bit of the beautiful Sunday afternoon; hear some music, see warm smiling faces of my neighbours and truly feel the spirit of Union waking up amongst old and young alike. Great job! Hopefully more to come?